Western blot analysis of extracts from NIH/3T3 and NCI-H1703 cells using PDGF Receptor β (28E1) Rabbit mAb (Biotinylated). 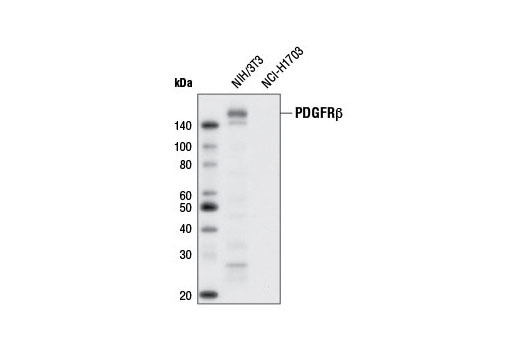 PDGF Receptor β (28E1) Rabbit mAb (Biotinylated) recognizes endogenous levels of PDGF receptor β protein. The antibody may cross-react with PDGF receptor α when highly overexpressed. Monoclonal antibody is produced by immunizing animals with a GST fusion protein containing a carboxy-terminal fragment of human PDGF receptor β protein. This Cell Signaling Technology antibody is conjugated to biotin under optimal conditions. The biotinylated antibody is expected to exhibit the same species cross-reactivity as the unconjugated PDGF Receptor β (28E1) Rabbit mAb #3169.